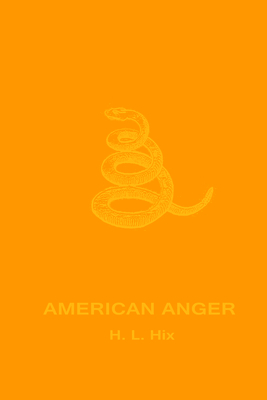 American Anger applies psychological and philosophical anger theories to the choler of American life. These genre-bending poems speak to the demographics that engage the Occupy movement, recognizing anger as the primary condition of the American empire. H. L. Hix has published an anthology, Wild and Whirling Words: A Poetic Conversation (2004), and ten books of poetry and literary criticism with Etruscan, including Shadows of Houses (2005), Chromatic (2006), God Bless: A Political/Poetic Discourse (2007), Legible Heavens (2008), Incident Light (2009), First Fire, Then Birds (2010), As Easy As Lying: Essays on Poetry (2002), Lines of Inquiry (2011), As Much As, If Not More Than (2014), and I'm Here to Learn to Dream in Your Language (2015). In addition to having been a finalist for the National Book Award for Chromatic, his awards include the T. S. Eliot Prize, the Grolier Prize, the Peregrine Smith Award, and fellowships from the NEA, the Kansas Arts Commission, the Missouri Arts Council, and Fulbright Distinguised Lectureship. He earned his Ph.D. in philosophy from the University of Texas at Austin, taught at Kansas City Art Institute, and was an administrator at The Cleveland Institute of Art, before accepting his current position as professor in the Creative Writing M.F.A. program at the University of Wyoming. He has been a visiting professor at the University of Texas at Austin and at Shanghai University.